It was a night filled with pounding rhythms and passionate dance. Bringing together performers from all over the region, Sounds of the Pacific was a showcase for some wonderful talent and cultural knowledge. The Maori kapa haka performers of Te Matarae/Orehu filled the stage with their fierce, physically powerful presence. The large group of men and women alternated between melodic musical items and garish war dances, in arrangements that were entertaining and fascinating. Humorous and concise explanations of some of the elements allowed the audience to gain a deeper understanding of Maori culture, while still enjoying the show. Creating a very different, almost celebratory atmosphere was the Solomon Islands group Tolegeu. Their music was created using panpipes of all sizes, ranging in pitch from tiny soprano to enormous bass, with larger, percussive versions as well. In striking white body paint and traditional dress, the all-male group performed traditional dances whilst playing their instruments. With knees bent, their stamping, hopping and occasional spear thrusting movement had a wonderfully natural rhythm and energy. Completing the evening was the highly polished troupe Te Vaka (pictured above). Primarily from New Zealand, but with strong ties to the tiny islands of Tokelau, Tuvalu, Samoa and the Cook Island group, they combine contemporary sensibilities with traditional Oceanic beats. With lyrics sung almost entirely in Tokelauan, the harmonies and melodies of the 12-strong group were very easy on the ear. The dancers of Te Vaka were also fantastic. 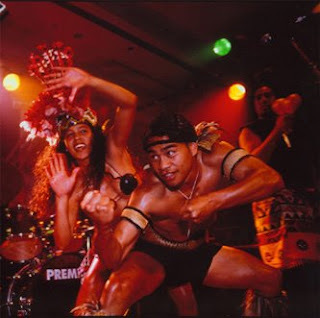 Performing with great enthusiasm and cheeky smiles, a young woman dressed in coconut-shells and grass skirts performed a beguilingly-good hip swiveling dance, while the men's positively potent routines lit up the ampitheatre. While the breaks between the groups were quite long, it was worth the wait to see these highly skilled, traditional yet entertaining acts.